for only thus will we fully understand the world in which we live. especially near space, may be absolutely crucial in bringing the world together. Houston, Apollo 11 . . . I've got the world in my window. The photographs of the Earth that have been brought back by astronauts since the 1960s have given us a new perspective on our home. In particular, these photographs convey two stark realities. First, the photographs reveal that much of the surface of our planet is inhospitable to human habitation. Saltwater oceans cover much of the Earth's surface, and freshwater bodies cover large areas on land. Vast deserts extend over portions of the globe in both hot and cold climates, from the Sahara to the Arctic. Mountain chains cross every continent, protruding high above the surrounding landscape; these are generally sparsely populated as a result of altitude and ruggedness. Second, these photographs dramatically document the high concentration of human development in those areas that are suitable for human habitation. Indeed, large portions of the surface of the Earth are managed by humans for the supply of their needs. New technologies, the building of extensive infrastructures, and the wide-scale management of resources increasingly permit human habitation in marginal areas. 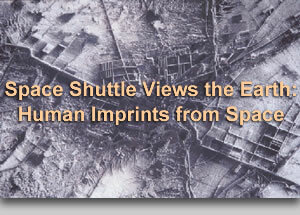 The surface of Earth is covered with a great variety of human imprints. Some are easily recognizable and others are more subtle. Typically, straight lines or geometric shapes on the landscape are a sign of human management. Linear street patterns, circular agricultural plots, and rectangular areas of clear-cut timber are only a few examples of these geometric imprints. Other patterns that are more subtle are smoke from deforestation fires, smog from heavily industrialized areas, and variations in land-use patterns across borders. This slide set attempts to convey a sense of the scale of human imprints on the Earth's surface. The 40 slides in this set can be divided into the following thematic categories: cities and towns (slides 1–5), resource exploitation (slides 6–11), strategic sites and borders (slides 12–15), environmental degradation (slides 16–22), agriculture (slides 23–31), transportation (slides 32–37), and sites of human interest (slides 38–40). Note: Image width is included as a indicator of scale. For oblique views the width of the bottom of the view is given. The orientation of each image is indicated by the north arrow in the text. Cities and Towns - Includes various types of human habitation, including clustering at various scales (village, town, city, metropolis). Resource Exploitation - Includes imprints from resource extraction and management of key resources (minerals, petroleum, water). Strategic Sites and Borders - Includes important geology sites, military sites, and international boundaries. Environmental Degradation - Includes human-induced changes to the landscape that heavily impact the environment. Agriculture - Includes Includes the key types of agricultural patterns seen on Earth and the water-management infrastructure that supports them. Transportation - Includes imprints left by, and the infrastructure that supports, planes, trains, automobiles, and ships. Sites of Human Interest - Includes features of general interest. The slides in this set can also be arranged thematically according to this table. This table is provided because many of the slides contain features that are relevant to more than one category. The authors would like to thank the members of the Space Shuttle Earth Observations Photography project at NASA Johnson Space Center for their tireless devotion to the shuttle photography project. The fruit of their efforts served as the primary inspiration for this slide set. Thanks also go to the staff at the Lunar and Planetary Institute for their assistance throughout this project, with special thanks to Debra Rueb for her attention to detail in the preparation of the slides. David W. Gwynn has a background in geology, geomorphology, and physical oceanography, and uses shuttle photography in both research and education applications. Dr. M. Justin Wilkinson trains astronauts in geography and geomorphology and applies shuttle photography to geological research in South America. Dr. Kamlesh P. Lulla is the Chief of the Office of Earth Sciences at NASA Johnson Space Center.